Article first published as Concert Review: Neko Case at Paramount Theatre, Seattle, WA, 7/10/11 on Blogcritics. 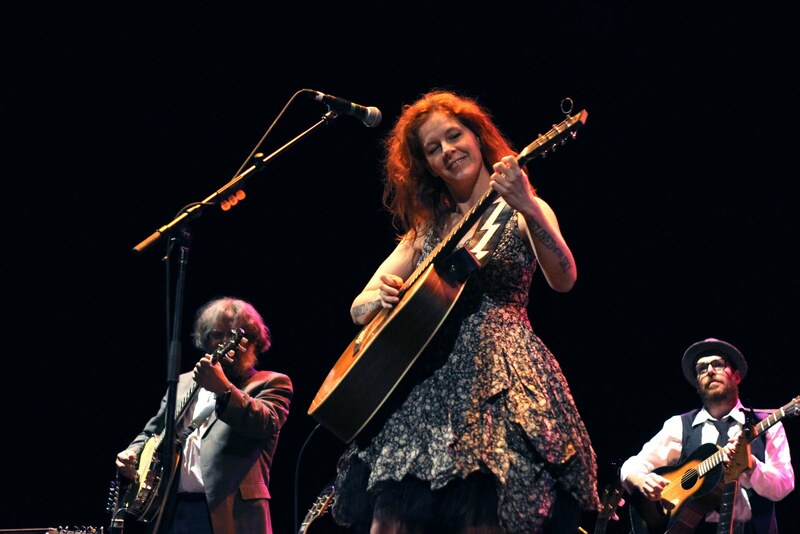 If not quite a hometown show, Sunday’s Neko Case concert at the Paramount Theatre was at least a home-state show for the Tacoma-raised artist, and according to her Twitter account, a tears-inducing (in a good way, we hope) experience. Celebrity Twitter feeds have a way of creating a false sense of familiarity, but Case’s razor-sharp wit and total lack of pretension in her frequent posts really do seem to allow a certain sense of accessibility. That carries over into her live performances, where Case’s relaxed, unrehearsed interludes punctuate her songs and their chill-inducing vocals. I’m not stumbling into hyperbole when I say that, for me, Case’s voice easily outpaces any other female voice in music. Keep that in mind when reading this review. Actually, she could probably do a whole set of Journey covers, and I’d still be right there. It’s been about two and a half years since Case’s last album, Middle Cyclone, but the inclusion of three new songs in Sunday’s setlist hopefully means we won’t have to wait too much longer for a new record. Otherwise, she mostly stuck to Middle Cyclone and 2006’s Fox Confessor Brings the Flood, while sprinkling in a few older numbers including “Porchlight” from Furnace Room Lullaby and “I Wish I Was the Moon” from Blacklisted, a song she wrote for her dad that would, she noted, soon serve as the background to vampires doing it on True Blood. Neko Case and Jon Rauhouse at the Paramount Theatre. Backed by a capable band and flanked by expert banterer Kelly Hogan, whose constant in-between-song quips (dealing with everything from KISS’s live-album chatter to Tacoma’s Frisko Freeze) grew more absurd as the show progressed, Case only had to belt out one of her melancholy, longing songs to center the attention directly back on herself. Led by superb pedal steel/guitarist Jon Rauhouse, the band didn’t venture into any particularly adventurous interpretations of the studio sound, but hearing Case unassumingly launch into the soaring, on-point refrains of “I’m an Animal” or “That Teenage Feeling” brought the music alive in a way that would've made fancy arrangements pretty unnecessary. When the instruments cut out on “Fox Confessor” and Case sung, “Will there be no one above me to put my faith in?” the stunned mood was downright reverent. One guy raised his hands in what looked like a kind of worshipful awe, and I knew how he felt. It’s a testament to the power of her voice — and Case’s genial, likable stage presence — that such transitions between goofy, casual guitar tuning and the gorgeous vocals not only felt natural, but essential to who Case is.